This luxury villa surrounded by a luxuriant landscape for sale is in the charming setting of Punta Ala. This two-storey property measures approximately 400 m2 and is surrounded by a luxuriant park measuring 1,500 m2. The main part of the estate is on the first floor of this villa and is home to a living area composed of a living room, a kitchen, and a dining room, and a sleeping area with three bedrooms. On this floor there is also a big terrace with a view over the surroundings. On the ground floor there is a spacious spare room that currently needs some restoration works and which has access to an external garden. All rooms are well-lit by natural light thanks to big, large windows which also offer a view of the surroundings and its green nature framed by the deep blue sea. This property's luxurious park is the perfect place to spend pleasant summer afternoons in total relaxation and privacy. This charming villa in Punta Ala is a perfect summer home at a stone's throw from the Tuscan sea, and may be enjoyed and lived in throughout the year. Its high and intimate position is also well-connected to towns and to the airports of Pisa and Grosseto. A well-known seaside resort, awarded in 2005 by Legambiente and Touring Club for the quality of its landscapes, this location is truly an ideal Tuscan location to spend summer holidays in. Immersed in the enchanting Florentine countryside, less than 20 minutes from Florence, this stunning luxury villa with tower from the 13th century is for sale. 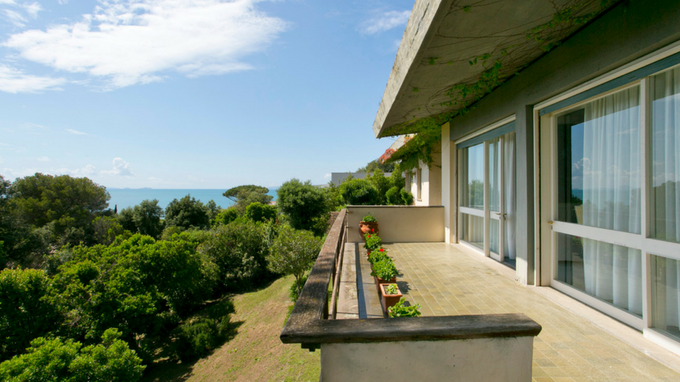 This refined villa for sale is in Tuscany, surrounded by Livorno's beautiful context. This prestigious property for sale is in the heart of Tuscany, surrounded by a natural hunting reserve of incomparable beauty.